It’s a glorious sunny day here on the Central Coast of California — I was just writing to some of our international office Directors (now we have 10, and an 11th coming soon) — and I realized that it’s already 2012 in many Six Seconds offices. So many different weathers at the one moment. So many languages. So many flavors and sights and sounds. All together – here, now. This one instant is bursting with possibility. Recently my family and I I had the pleasure of sitting zazen with an amazing monk. He’s the fifth generation of monks in this 600-year-old temple, Shunkoin, in Myoshinji (in Kyoto), and his son will be born soon. Sitting on the tatami mats glowing in the morning sun, looking at the simple geometry of hand-cut wood framing the walls, watching the incense smoke curling around my 10-year-old son (in his bright orange signature colors), I was touched by the confluence of all these rivers coming together in that one moment. 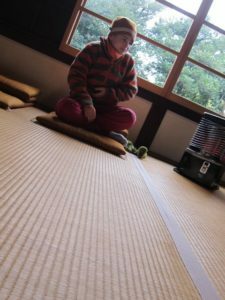 Kawakami-san, “our” monk, reminded us that every moment, the moment is passing. And as the moments pass, often we end up with fewer and fewer choices. Life is not a static experience, but one of continuous flow. This morning, we buried Max’s favorite chicken, Puff. I tied a few of Puff’s orange-gold feathers with a white ribbon, and gave them to Max. As the kids filled in the grave, Patty sang “The Red River Valley,” the song we sang to say goodbye to my dad, and I was overflowing with this strange mix of feelings. Sorrow and loss, but also joy and appreciation. A stunning day in this glorious place we live — beautiful golden feathers in my lovely boy’s hands, a boy gentle and caring enough to be completely in love with a soft fluffy bird. This part of my family together, but many of us spread far and wide, including beyond this life. So many paradoxes, so many threads together. I thought of Kawakami’s council, that just because life is constantly passing and flowing, we don’t have to lose the choices if we stay more aware, more awake, in the passing moments. My experience today was that letting myself feel the beautiful mix of emotions awakens something in me, not fighting against myself, not trying to hold still in the flowing current — but feeling it for what it is, opening to it, and learning from it. So, a New Year’s wish for you, and me, is that we feel more moments. May your 2012 be abundant, verdant, and exuberant. LIFE has moments… A moment is life…A moment has Feelings….A Feeling is living….And living is Feeling….Thank you so much Josh for giving us an opportunity to live, observe, understand Moment of life…Thanks for sharing….. The clouds that move ,the changing seasons, the bubbling volcanoes with a pugnacity of their own and the seeds that sprout from within a rock make us aware that nothing really perishes .Every form leaves its mark and its trail of treasure…..forming a yoke,within! Happy New Year to you too….